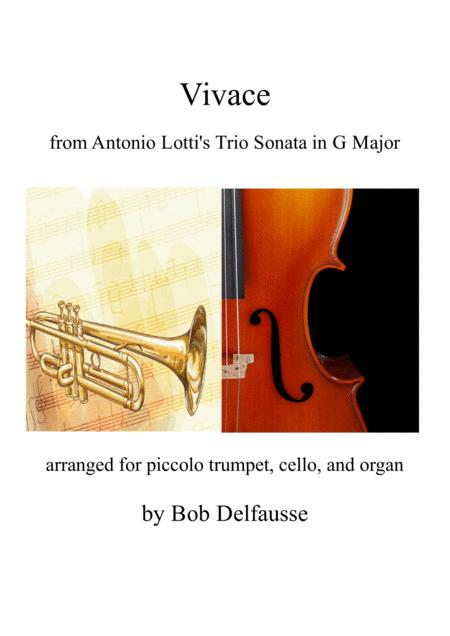 This rousing final movement of Antonio Lotti's Trio Sonata in G major will work perfectly either for a church service or a recital. The piccolo trumpet (in A) , cello, and organ make a wonderful mixture of musical voices. I've included a flute part (which would work for violin, oboe, etc.) as a substitute for the trumpet. The organ part, written on the grand staff (no pedals) could also be played on piano. Suitable for advanced intermediate musicians and above. Duration: 2 minutes, 11 seconds.